Datuk Dr Tiki Lafe mengaku dalam temuramah Astro bahawa YB Datuk Sylvester Entri, YB Rosey Yunus, YB Datuk Peter Nansian dan YB Paulus Ngumbang menyokong beliau MELAWAN calon BARISAN NASIONAL. BAU: Several of those who attended the gathering themed ‘Perhimpunan Calon Rakyat BN — BN People’s Candidate Assembly’ at Bau Civic Centre on Thursday night claimed they were tricked to believe that the function was held with the BN candidate for Mas Gading, Anthony Nogeh. “We were earlier told that the function was to meet with the BN candidate (Nogeh) but I was surprised that it was a dinner with (Mas Gading incumbent Datuk) Dr Tiki Lafe,” said one of the invited guests. Some members of the press who were invited to the function were told that it was a dinner organised by Tasik Biru assemblyman Datuk Peter Nansian Ngusie to introduce the BN candidate. It was early mentioned that there would be 70 dinner tables and guests would be served. However, they were surprised that it was a buffet dinner. 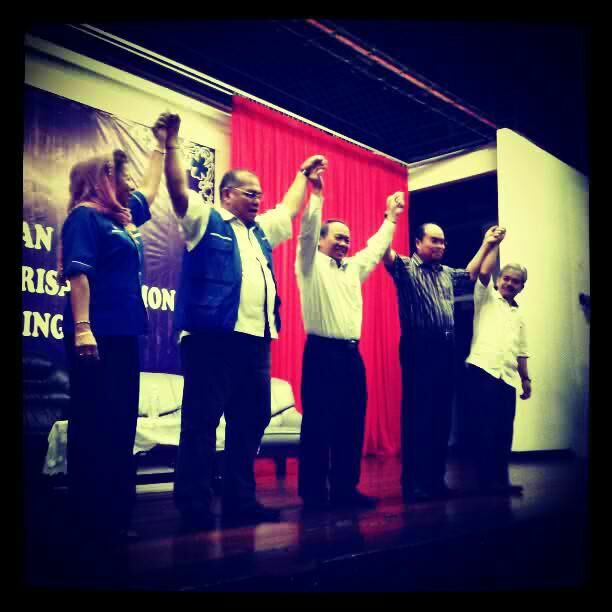 During the function, partyless Dr Tiki announced that he would stand as a BN-friendly Independent in the May 5 general election. Also at the function were Nansian, Datuk Slyvester Entri Muran, Paulus Palu Gumbang and Rosey Yunus, who are also partyless like Dr Tiki following their sacking from SPDP over a year ago. A Bidayuh community leader in Bau, Pemanca Daniel Teho, said community leaders attended the function because they wanted to listen to what Dr Tiki had to say. He admitted that before this community leaders had thrown their support for Dr Tiki’s candidacy. “We will have a meeting to discuss and decide our next course of action,” he said. Daniel denied that community leaders in Bau and Lundu were against the government and BN. Daniel disclosed that they had formed a community leaders-campaigning team but he was unsure if they would proceed with their original plan to campaign for Dr Tiki. Meanwhile, a SPDP Mas Gading spokesman said efforts were being made by the party’s Tasik Biru and Opar branches to round up all community leaders in the constituency to support Nogeh. “We have no quarrel with the community leaders and we fully understand their situation prior to the announcement of the BN candidates. “Now that the candidate for Mas Gading has been made known, we happily invite them to join us to ensure victory for BN in Mas Gading,” said the spokesman. awang tengah tidak mahu kehilangan salah seorang dari MP yang terlibat dalam rancangan rampasan kuasa jawatan cm sarawak tahun ini. Oleh itu awang tengah mengarahkan penyokongnya tiki lafe untuk melawan calon Barisan Nasional.